Ash splints fill my bathtub and stain it yellow, shreds of ash are felted into all of my wool socks, my cat rolls in piles of scraps and then walks off to some other part of the house, leaving a trail behind him. Ash falls out of my hair, I find it in my tea, in my bed. My life is saturated with ash, and I’ve yet to weave a single basket. Every evening after dinner, I pull a splint out of the tub where they’re soaking. Some nights, the ash splits beautifully, producing smooth, silky ribbons surprisingly strong for their paper-thinness. Other nights, the fibers stubbornly cling to each other, testing the strength of my hands and leaving me with bumpy, uneven ribbons. I can’t tell by looking at a splint whether it will be easy to split. I have lots of still-untested theories. 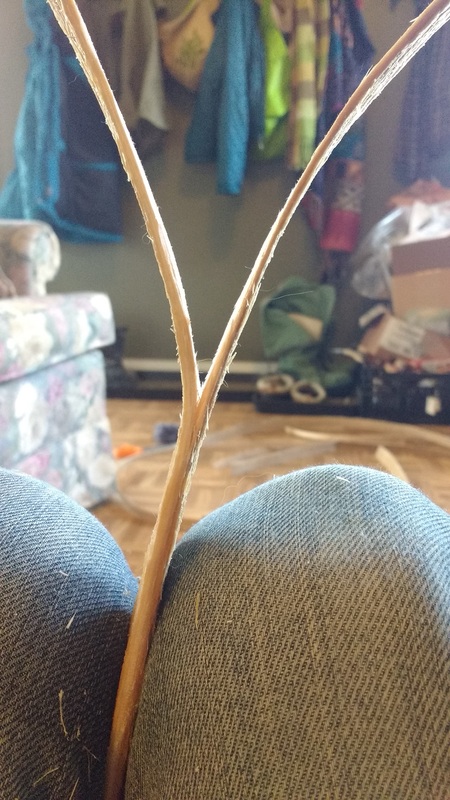 Sapwood vs. heartwood, splitting from what was the top of the tree vs. from the bottom (difficult to tell top from bottom now that the splints are separated from the tree), length of soaking time, depth of the initial splitting cut, thickness of the growth ring. One thing I’m trying is singing while splitting. I’m singing to the ash, although the only thing I can say for sure is that singing changes my own state of mind. Depending on the song, it makes me slow down, look more carefully, feel gratitude and appreciation. So, whether the song makes the ash more cooperative, or the song makes me more patient and careful, it does seem to make a difference. I’m making decisions as I go about the level of precision and refinement I would like to aim for, driven more by physical limitations than by impatience. The splints are all really rough and fibrous on the outside, where the spring growth separated. 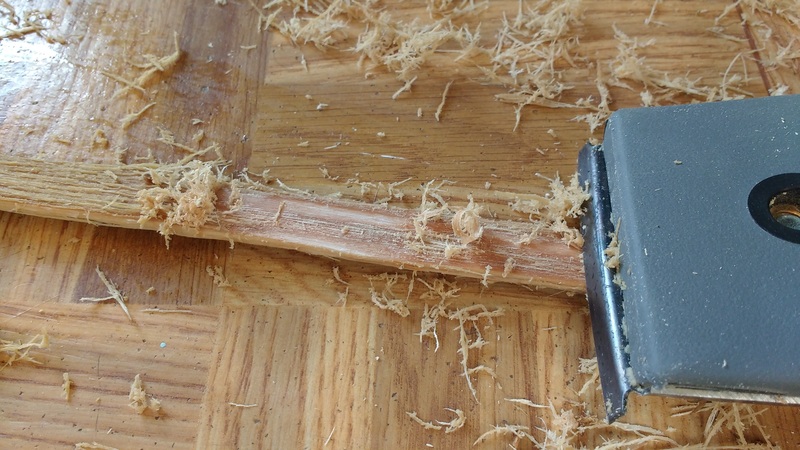 It seems that most professional basket-makers remove this texture by scraping it smooth with a knife, block plane, or sand paper. I’m finding this part of the process really difficult. My hands’ strength and stamina are challenged by this type of work. It’s okay with me if my baskets aren’t smoothly professional, but I don’t want them to be constantly shedding. My compromise is to run over the surface with a paint scraper to knock off the majority of the fibers. In the splitting process, I’m creating lots of little scraps that I carefully trim and coil up, because they may come in handy. Once I had a nice collection, I couldn’t resist making a tiny basket. I think its wonkiness is adorable, and the learning experience will help me when I make a larger basket. 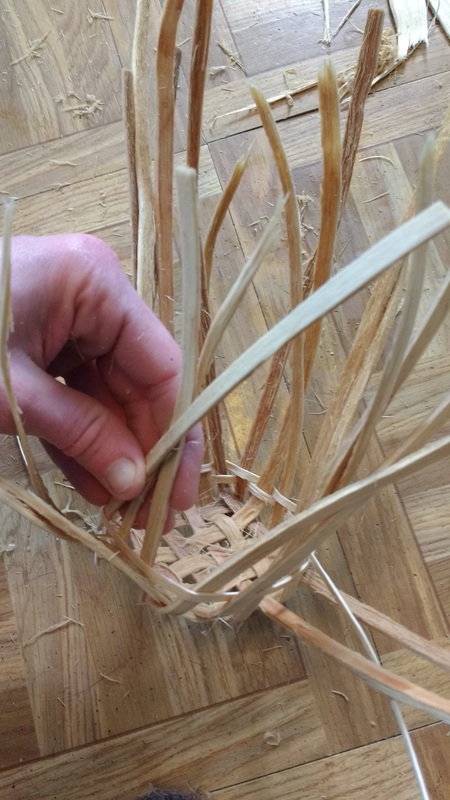 There were some challenges particular to making a tiny basket, such as not being able to fit my hand inside. During the harvest, I promised the trees that they would be remembered in song, photos, and baskets. I swear to you that I heard the tree exclaiming in mild outrage as I worked on this basket, “Seriously? This is how I’m going to be remembered? ?” Don’t worry, tree. There will be more baskets.